The Northern Carolinian Pawpaw (Asimina triloba) is a fruit weighing 200 – 500 grams and growing 9-15 centimeters in length. It has a rounded cylindrical shape and leathery greenish skin that turns to yellow then black when ripe. The flesh of the fruit is sweet, aromatic and custard-like, and surrounds hard, dark brown seeds. The tree is native to the northern Carolinian forest, historically ranging from parts of the southeastern United States to southeastern Canada. With a warmer climate, wild plantings have spread beyond Niagara to areas north of Lake Ontario, but cultivation has been much more recent. Ernie Grimo and his family have been propagating and disseminating selections of pawpaw for several years, and fruit farmers in Niagara have been planting them recently. There are at least two well-established plantings within the city of Toronto. Because the tree is native to the area and locally adapted, pawpaws do not require the insecticides or fungicides that introduced, exotic fruit trees require. The tree is also a host plant of the zebra swallowtail butterfly and provides a habitat for this important pollinator. 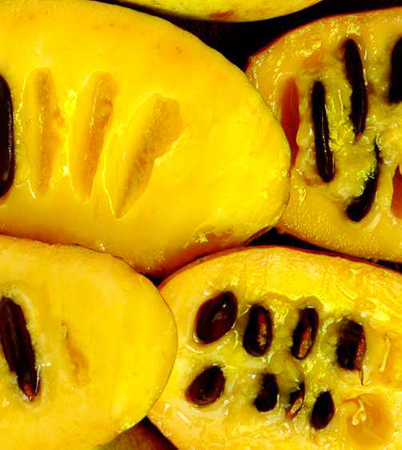 Pawpaw fruits are available commercially, but currently in a limited supply, sold seasonally in the farmers’ markets of Toronto and the surrounding area. The fruit can also be preserved to be sold year-round. Those interested in growing their own can find trees to purchase from several nurseries in Ontario. Development of once wild spaces are threatening the native pawpaw plantings, but promotion of and appreciation for the fruit gives value to the wild plants and increase interest in cultivation and identification of varieties. Their medium size and shade tolerance makes them excellent trees for integration into urban agriculture.